Does Reflecting Pool create any colour if the other land in play is an Exotic Orchard? : Gain one mana of any colour that a land an opponent controls could produce. Hey, Ancestral Statue is too important of a creature with Animar, you realize this, but you don't have any cards that tutor for it? In a $100 deck I can understand why you wouldn't have a tutor, but not in a $400 deck. Consider Fabricate ? It doesn't break the bank and if not tutoring for Statue it can tutor for Curio. Consider Fauna Shaman ? She also doesn't break the bank and can be a repeatable creature tutor. That's good when you can't afford to add other expensive price creature tutors. Hell, if price is a concern then cut Dark Depths and add tutors that can help in a game to search for the cards that break Animar. These cards are more important than Depths for your overall deck to function. 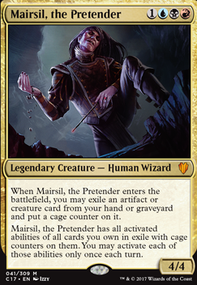 Empath is a very good tutor here for Eldrazi because he's a creature who you can bounce back to your hand. Faeries helps to play more creatures a turn by untapping your lands. Visionary is repeatable draw who's a creature. Witness is very good if you can bounce her. 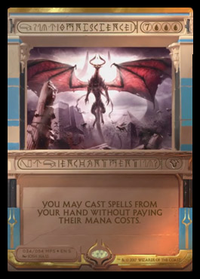 Can even cut Keranos, God of Storms , Thought-Knot Seer and Propaganda for price to add Lantern and more dual lands to the manabase. Dual lands and Lantern will help your deck much more than these cards do. Mana fixing is pretty damn important to have in a three color deck especially with a restrictive, no colorless mana, three colored mana cost Animar who you want to consistently cast turn three. I'm sorry if I was harsh, but you're forgetting basic principles of Commander deck building while presenting yourself as a good player who other players should listen too. Good luck with your deck. Bloodfell Caves , Cinder Barrens , Dismal Backwater , Forsaken Sanctuary , Foul Orchard , Graypelt Refuge , Highland Lake , Jungle Hollow , Rugged Highlands , Scoured Barrens , Stone Quarry , Submerged Boneyard , Swiftwater Cliffs , Timber Gorge , Tranquil Cove , Wind-Scarred Crag and Woodland Stream . I think it will increase the consistency of finding your colors. You can even lower your land count to 39 this way. hellhole3927 on UW Petitioner Self Mill...Reanimator Combo? I LOVE THE DECK. 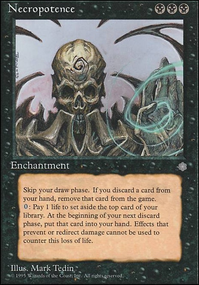 I'm actually trying to make a Persistent Petitioners Reanimator deck right now, but I wasn't able to figure out what to target with reanimation spells. You figured it out though. 1) Take out Thrumming Stone , yes the card can do broken things, but I don't know how beneficial it will actually be in this deck. Also the decks that it is used in are very straight forward ones with no set up ( Relentless Rats and Rat Colony ), not things that need set up ( Shadowborn Apostle ). 2) Take out Avacyn, Angel of Hope , yes she is a great card, but when she's the only big body in a deck the body itself won't do much the same way mill doesn't do much to a group of 3 opponents. Also what in this deck would your opponents want to blow up on your battlefield? 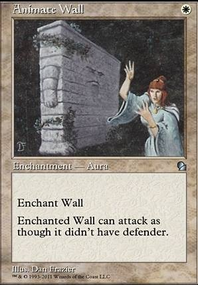 In the end she is just a defensive card in this deck that will take way too much set up to benefit from. 3) Card Draw, you have good card draw in here, but a few ideas for additional things would be Rhystic Study , Mystic Remora , and Land Tax . 4) The mana base, before I get into my suggestions on the mana base I will just say any base can benefit from a ton of fetchlands and other things like that and I'm not gonna sit here and just tell you to add in every fetchland in your colors. Now to my suggestions, cut all taplands they hurt a deck much more than you may think. 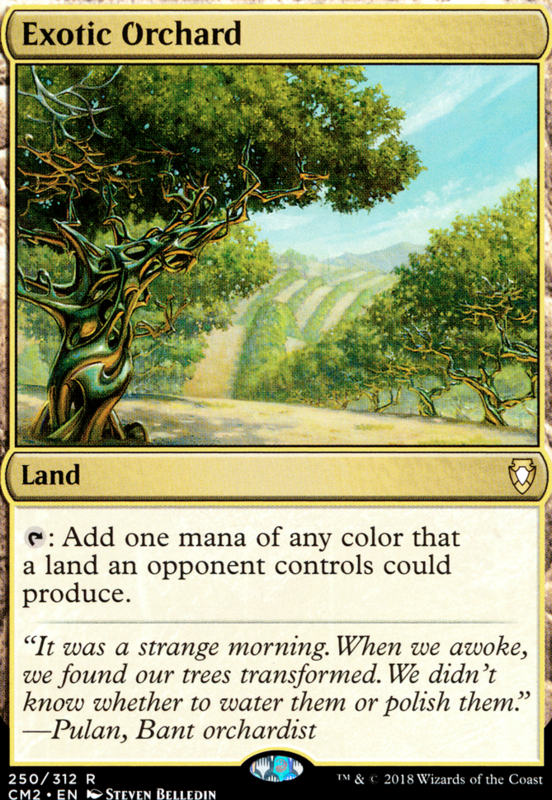 I) Reflecting Pool and Exotic Orchard are also two more lands you could add if you want to. J) As far as I can tell you don't seem like you'll be going to combat much and if you're not then Glacial Chasm would be great. BTW, when I finish designing my deck list I'll let you know what it is in the comments here so you can take a look at if you want. Hey, looks good for a budget causal deck. 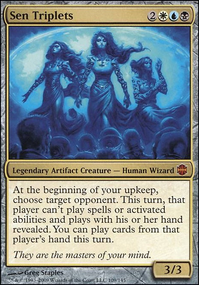 Is Sydri, Galvanic Genius your Commander? I don't see her card in the decklist. 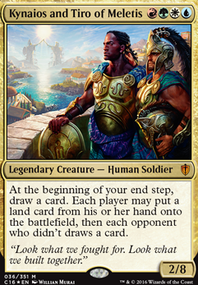 All Commander decks usually show the card of the Commander, but it's missing here. Good job winning more than losing, but 28 lands with only 9 mana rocks and a 4.2 avg. CMC is pretty risky. The first thing to consider doing is cutting all the five drops except Adjudicator and Scourglass. I suggest to cut the rest five drops because the six drops, which there's also a lot of them, are much better cards. My advice is to prioritize all your six CMC or higher cards. Choose a few of them and cut the others for lower CMC support cards. I'm going to break my advice up into two comments. The first comment is about budget lands to consider adding as well as cards to consider cutting. The second will be budget cards that are good with artifact strategies to consider adding and cards to cut. Can add all these for about $25. Hey, saw your forum topic asking for help. Good start, but I think you can expand on the stealing your opponents creatures strategy and get more value from creatures you steal. There's also several budget staple Commander cards to consider adding. All my cards suggestions are budget ($5 or less each). Command Tower , Exotic Orchard , Reliquary Tower , Yavimaya Coast , Shivan Reef , Cinder Glade , Game Trail , Ash Barrens , Naya Panorama , Bant Panorama are all good budget lands that can ETB untapped. Captivating Crew , Willbreaker , Dominus of Fealty , Zealous Conscripts and Roil Elemental are repeatable sources of stealing. Evolutionary Leap , Ashnod's Altar , Greater Good are repeatable sources of value by sacing your opponent's creatures after you steal them. Use these sac outlets with Skullclamp for even more value. Sol Ring , Chromatic Lantern , Simic Signet , Gruul Signet , Izzet Signet , Talisman of Impulse , Fellwar Stone are staple mana rocks for Commander. Rattleclaw Mystic , Elvish Mystic , Llanowar Elves , Arbor Elf are budget one drop mana dorks. Sakura-Tribe Elder , Nature's Lore , Farseek , Fertile Ground , Farhaven Elf is more good ramp. Fauna Shaman , Signal the Clans and Gamble are budget tutors. Mystic Remora , Eternal Witness , Chaos Warp , Beast Within , Reclamation Sage , Reality Shift , Stubborn Denial , Arcane Denial are staple Commander cards. Temur Ascendancy , Coiling Oracle , Trygon Predator , Dack's Duplicate and Shaman of the Great Hunt are good Temur cards. Hero's Blade and Swiftfoot Boots is good equipment with Yasova. 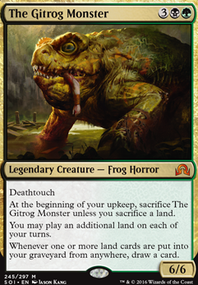 Temur Sabertooth is repeatable bounce of creatures who have good ETB abilities such as Conscripts. Cloudstone Curio 100% needs to be added... yesterday. Equilibrium and Tidespout Tyrant are also options for etb abuse. Vizier of the Menagerie is Chromatic Lantern on steroids here. Worth it just for the color fixing let alone the pseudo draw. Exotic Orchard is a budget friendly land that deserves a spot. Cloud of Faeries , Great Whale , and Stadium Vendors are all great here for infinite mana combos.